We believe that our children and youth are a part of our church family. So they are invited, welcomed, and included in all church ministries. But we do have age specific ministries for them as well. Our Youth and Family Ministry Board works with our Family Ministry Coordinator to plan monthly activities for our 7th through 12th graders and their families. 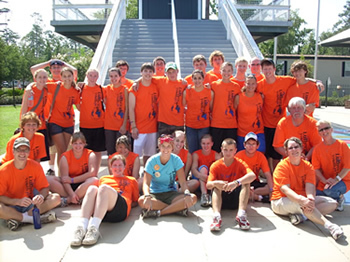 The activities range from service learning to Bible Studies to fun fellowship events. Some events are just for 7th & 8th grade and others for 9th - 12th grade. Some of the 7th - 12th grade events are planned as Family Fun Nights. These events are for all 7th - 12th graders to come to by themselves and/or with their parent(s). All events are announced in the Spire, bulletin, in class, mailings, e-mail, etc. Our Confirmation Ministry begins in 3rd grade with receiving of Bibles and continues until 10th grade. Weekly classes are offered in 7th, 8th & 9th grade. To learn more about this ministry, speak to Jamie Travers, Family Ministry Coordinator. Each summer, we encourage our youth to attend one of our 3 local ELCA Bible Camps. We provide scholarship assistance for those who attend. 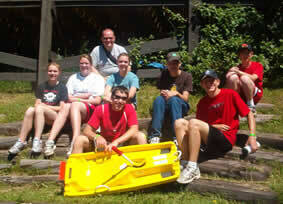 We also plan 2 summer trips, one for 7th & 8th grade and one for 9th-12th grade. On Sunday mornings, 9:40 - 10:40 we offer Christian Education for children age 3 through 8th grade. Sunday School runs from September through May. Our board of Youth & Family Ministry along with our Family Ministry Coordinator plan monthly opportunities of fun and fellowship for 3rd through 6th graders. Activities often take place on days off from school. Each summer we offer a Bible Camp experience for children age 3 through 6th grade. The day camp happens at Ruger Park and is a combined ministry with Peace and Our Savior’s Lutheran Churches. The camp is a week long camp, 9:00 - 5:00. 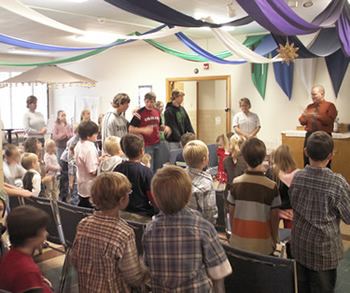 We also encourage our younger members to attend one of our 3 local ELCA Bible Camps. We provide scholarship assistance for those who attend. At the beginning of August we offer a Bible Camp experience, called Sojourners for 3rd through 6th grade at our Retreat Center on Creel Bay. We have a St. Olaf group online on Facebook. This is another way that we can stay connected. There are announcements about St. Olaf ministries, a place to make prayer requests, and see pictures and video devotionals. Stop by the site and join us.